Sorry if the song gets stuck in your head. It was stuck in mine throughout the entire roasting process, even though it’s nowhere near Christmas and we didn’t have an open fire. I hate that! The other night, Nick walked through the door and tossed a sack into my lap. I was surprised for two reasons. They were so pretty! Shiny with a rich, brown color. 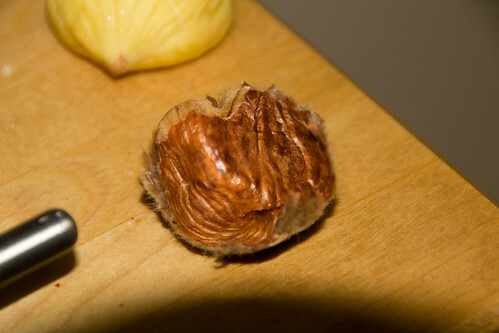 I’d never eaten chestnuts before, let alone seen them in their raw form. I was most definitely intrigued. 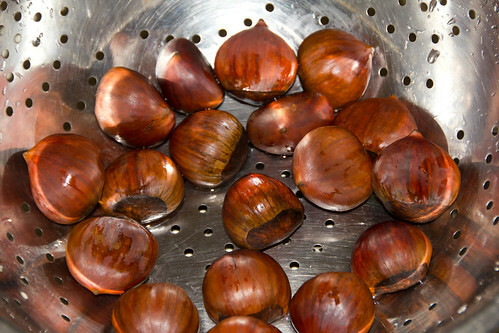 Roasting chestnuts is actually a very easy process. All you have to do is slit a few x’s into them and put them in the oven at 425F for about 25 minutes. And then voila! 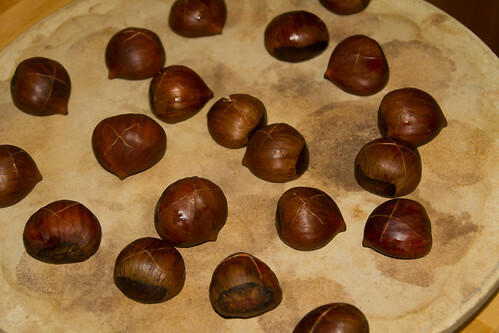 As long as you cut the vents deep enough, the chestnuts burst open at the slits and they are ready to peel. You have to let them cool only enough to handle. The cooler they are, the harder they are to peel. Plus, they taste better warm. The texture and the taste were both surprising. 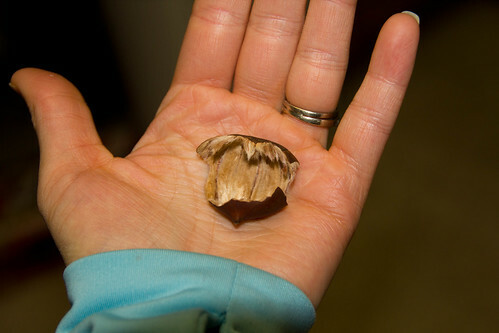 Kind of like a potato crossed with almonds? Starchy and bready like a potato, but sweet and nutty like an almond. 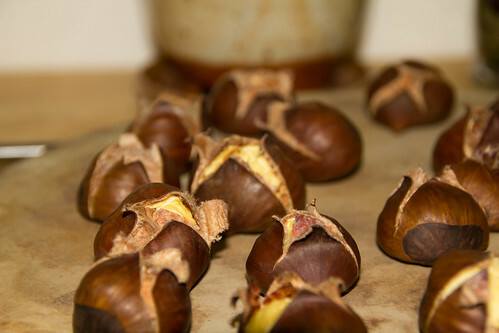 When we google searched how to roast chestnuts, a lot of people said that they had to get more than they needed because they found a few that were rotten, and a few that just totally fell apart. 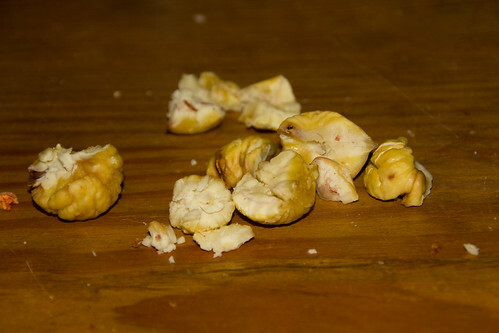 Although we did have some fall apart, the pieces were still delicious. 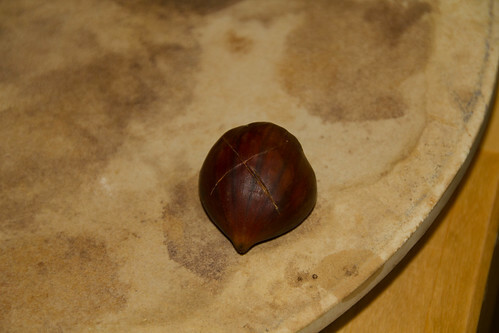 So unless you need a whole chestnut that will look pretty, it’s not a huge concern. We also didn’t find any that were rotten. And apparently, if you don’t cut the vents deep enough, these things can explode in your oven! That would make for an exciting Christmas. The inside of the shells are furry. 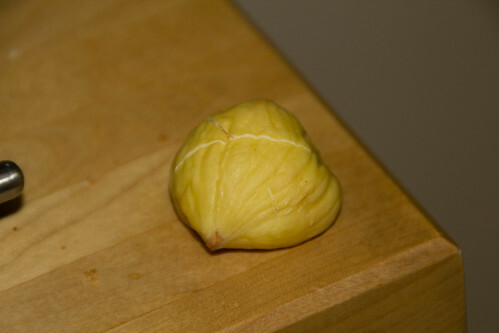 When the chestnuts get too cool, the skin doesn’t always come off with the shell. It takes a little more time to get the skin off, but it’s actually kind of therapeutic. Much the same as peeling potatoes or shelling peas. Mmmmm. These were so good when they were warm! They were all right cool, but the yum factor definitely decreased. I would say that these are more of a novelty item because of the time involved peeling, but I can understand why people buy these from street vendors in big cities. Especially on cold winter evenings. 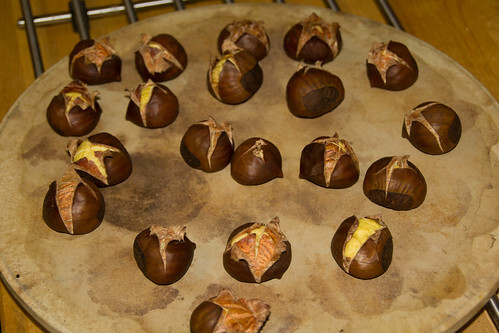 Now my question is, other than just eating straight up, what do people do with roasted chestnuts? Previous Previous post: New Ingredients!